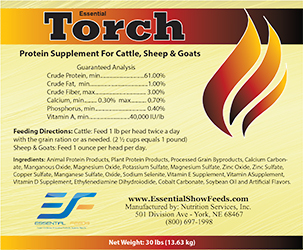 Essential® Torch is a supplement used to trim your animal and burn fat. This product work extremely fast will often times only be need for 20-30 days. (It can be used for longer or shorter duration depending on the desired look). Cattle: Feed 1 lb per head twice a day with the grain ration or as needed. (2 ½ cups equals 1 pound) Sheep & Goats: Feed 1 ounce per head per day.